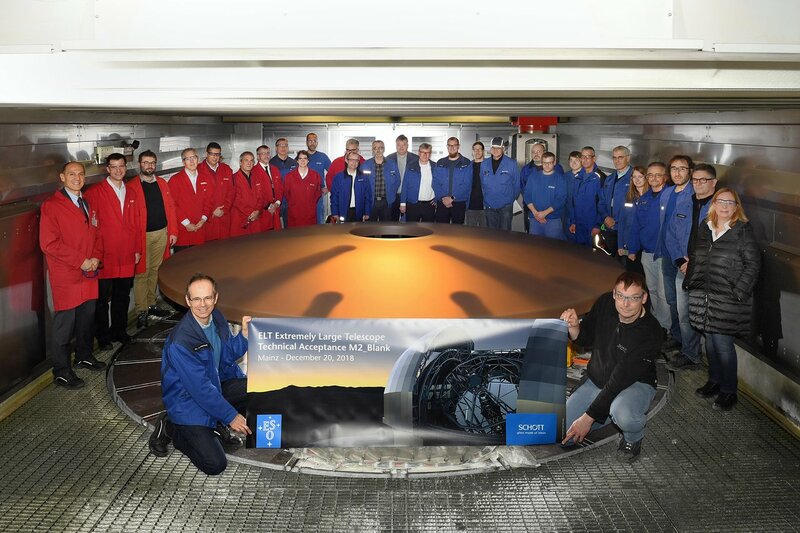 Work on the elaborate optics of ESO’s 39-metre Extremely Large Telescope (ELT) has taken a major step forwards following the successful casting, annealing, ceramization, machining and acid-etching of the substrate for the ELT’s secondary mirror, M2. 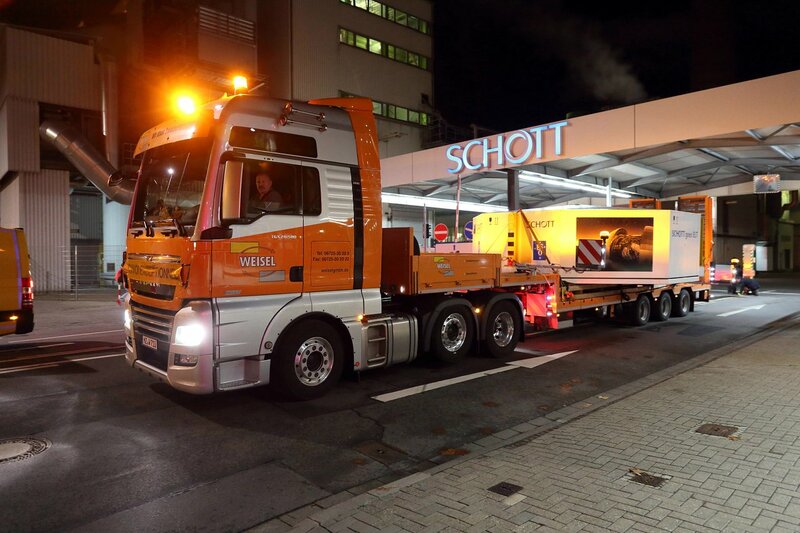 This massive 3-ton mirror blank has been successfully machined from a slab of the low-expansion ceramic material ZERODURⓇ into its near-final form by the German company SCHOTT . 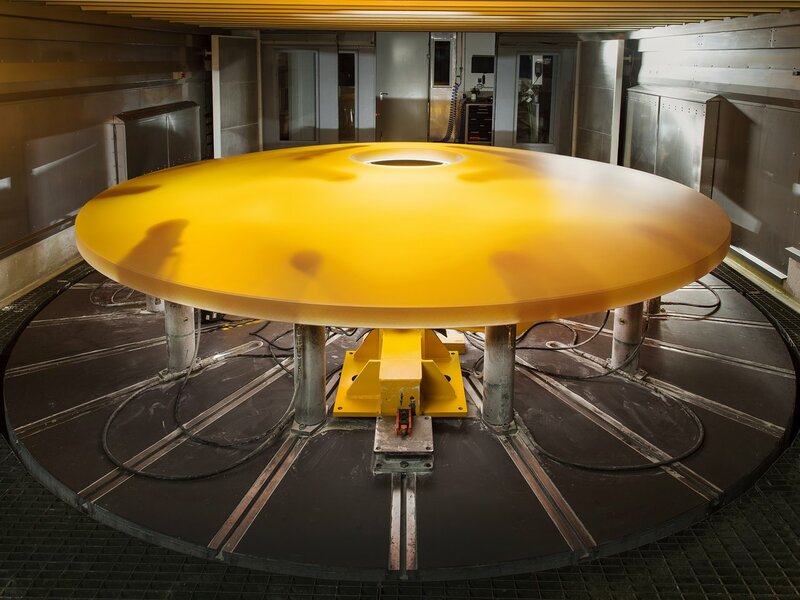 The creation of this technological masterpiece was a challenging process, requiring state-of-the-art CNC machines to correctly grind the mirror blank. Now, safely stowed in an extra-large transport box, the blank is being shipped to France for final grinding and polishing by Safran Reosc. Despite being the ELT’s secondary mirror, M2 still has an impressive diameter of 4.25 meters — larger than the primary mirror of many astronomical telescopes operating today. 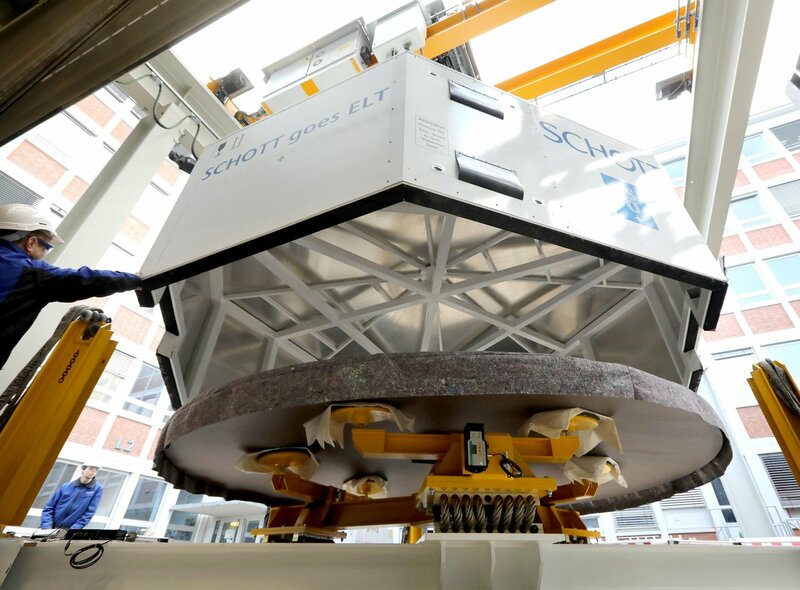 Following sixteen months of precision manufacturing at SCHOTT, M2 will now receive its final touches — more precisely, fine polishing — at Safran Reosc. The French company will polish the mirror to a precision of 15 nanometres across its entire optical surface, and a final layer of reflective silver and a wafer-thin protective layer of silicon oxide will be applied by ESO at a coating facility at ESO’s Paranal Observatory in Chile. ZERODURⓇ ceramic glass was originally developed for astronomical telescopes in the late 1960s. It has almost no thermal expansion, which means that even in the case of large temperature fluctuations, the material does not expand. Chemically, the material is very resistant and can be polished to a high standard of finish. The reflective layer, made of aluminium or silver, is usually vaporised onto the extremely smooth surface shortly before the telescope is put into operation. Many well-known telescopes with ZERODURⓇ mirrors have been operating reliably for decades, including ESO's Very Large Telescope atop Cerro Paranal in Chile.